Comments Off on 2016 GACTA Middle School Tennis Begins Soon! 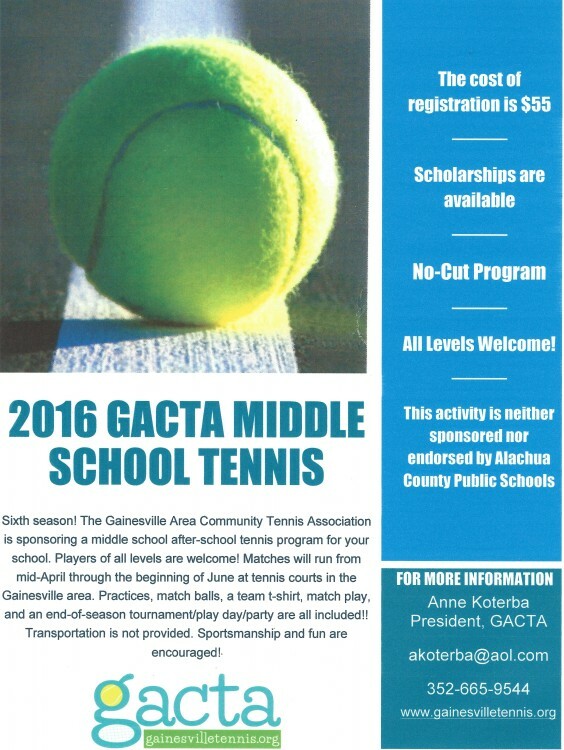 2016 GACTA Middle School Tennis Begins Soon! The sixth season of GACTA’s Middle School Tennis season is starting soon! This no-cut program welcomes players of all levels. Matches will run from mid-April through the beginning of June at tennis courts in the Gainesville area. Participating schools include: Lincoln, Westwood, Howard Bishop, Kanapaha, Oak Hall, Jordan Glen, and we hope to welcome Oak View and Queen of Peace to the program. If your school is not listed and you are interested in starting a program please contact Anne Koterba, program coordinator at akoterba@nullaol.com.